"How often, when man abandons the helm in despair, woman seizes it, and carries the home-ship through the storm! Man often flies from home and family to avoid impending poverty or ruin. Woman seldom, if ever, forsook home thus." The quote above from Godey's Lady's Book, a popular 19th-century women's magazine, offers a familiar depiction of women as homemakers and mothers sailing the "home-ship." Yet, a banknote issued that same year by the Sanford Bank of Sanford, Maine, depicts two women weaving at industrial looms; a third unattended loom behind them indicates that this is a factory scene, and that these women did in fact leave home to avoid poverty through paid work. Paper currency is not only a symbol of monetary value, it is a form of print media, and consumers look at the images on their paper money every day. Therefore the men who designed the Sanford Bank note made deliberate choices when they selected this image. This isn't the only example of women depicted as laborers on notes. In contrast to the current American norm of featuring famous people on notes, anonymous women at work have been a popular subject for money starting in the 19th century, and they appear in places as far apart as the United States and French Equatorial Africa. In order to understand why everyday women appear on so many types of notes in so many places and times, it is important to understand the role that images on money fulfill. On banknotes issued by governments, detailed images can help to make counterfeiting more difficult, but they also provide an opportunity to depict national values in a place that citizens will see every day. In 2015 when the U.S. Secretary of the Treasury announced the redesign of the ten dollar bill to feature a woman, the press release expressly stated that the woman chosen would emphasize something about American democracy. 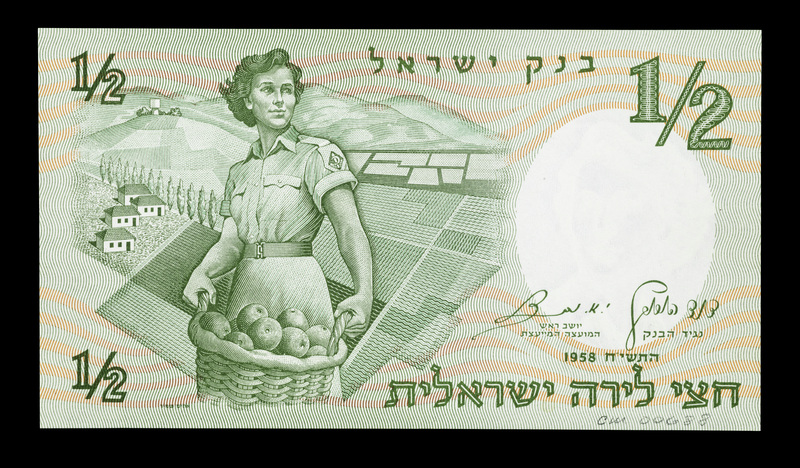 The Israeli half dollar note from 1958 is another particularly striking example of notes expressing national values. The image is of a muscular woman wearing a dress, and holding a large basket full of apples. Her hair is windblown and she is standing against a background of manicured fields, where she presumably harvested her fruit. This image sends a clear message: the ideal Israeli female citizen is feminine and strong, and actively participates in the economy. Not all notes are government issued. Sanford Bank was not affiliated with any government when it printed the note featuring female weavers. Before the Civil War, American banks issued their own paper money. In a crowded market, with many banks and competing currencies, banks used the images on their notes as advertising and reassurance that a particular bank was trustworthy. The image of the female weavers on the Sanford Bank note therefore sends a powerful statement that women performing factory work was both a common occurrence, and one that signaled economic health and stability. These depictions of women working illustrate the range of ways in which women have participated in their communities. Pictures of women performing paid work on the very paper money with which they would be paid sends a powerful message about women's buying power and their participation in public life in a wide range of places and times. As equal pay for women, parental leave, and the cost of child care continue to be subjects of public conversation, these notes help remind us that questions surrounding women's economic activities are not new, nor isolated to America. These notes also help to remind us of the many women whose names we may never know, who have participated in making American, global, and economic history. Kate Steir is a PhD student at Georgetown University and a museum curatorial intern. See these objects in our "Women on Money" display, within the Stories on Money exhibition.